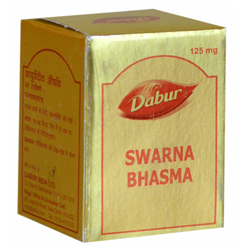 Dabur Swarna Bhasma Treats & Improves Physical Strength, Mental Strength & Relieves Chronic Fever, Cough, Breathlessness, Nervous Weakness. Improves Body Resistance, Physical & Mental Strength. Useful in chronic fever, Cough, Breathlessness, Sluggish memory, Nervous weakness. Energetic, Medhya (Memory enhancer), Improves body resistance and pacifies Tridosha. This medicine improves Physical, Mental strength and helps to relieve, chronic and complicated diseases. This is also useful in chronic fever, Cough, Breathlessness, Sluggish memory, Nervous weakness. 8 mg to 125 mg twice a day with milk, butter, and sugar or as directed by the Physician. Milk, Butter, Ghee, Rice and wheat.